How to get to Askja? What not to do at Askja? Askja is a 50 km3 caldera, located in the remote part of the Icelandic central highlands. The name refers to a box or casket of some sorts and comes from the fact that a few calderas nest within the Dyngufjöll mountains which emerged in eruptions under a glacier cap during an Ice Age. Askja was formed a bit later, during a major ash eruption during the late end of the Ice Age which caused the roof of a magma chamber to subside. The Askja caldera includes a few volcanoes and craters including one of Iceland’s most famous one Víti, meaning Hell. 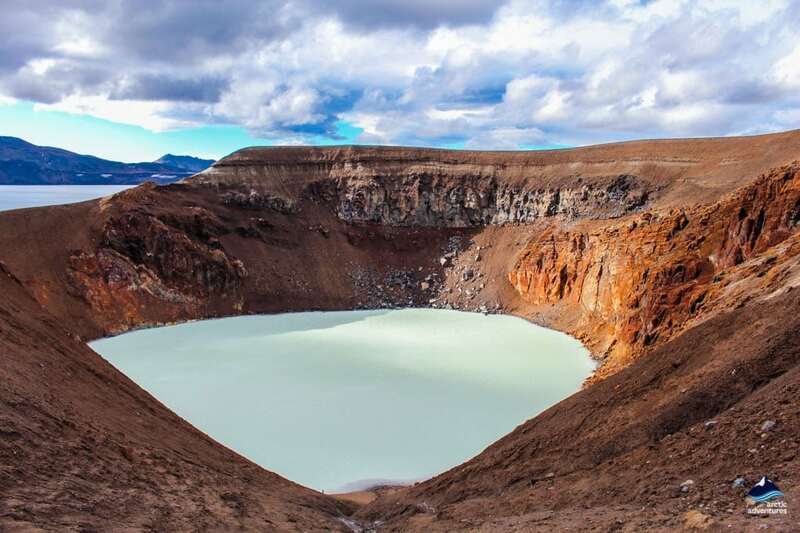 Víti is an explosive volcanic crater but water has accumulated in the crater and the temperature of the water is around 30°C or 86ºF. 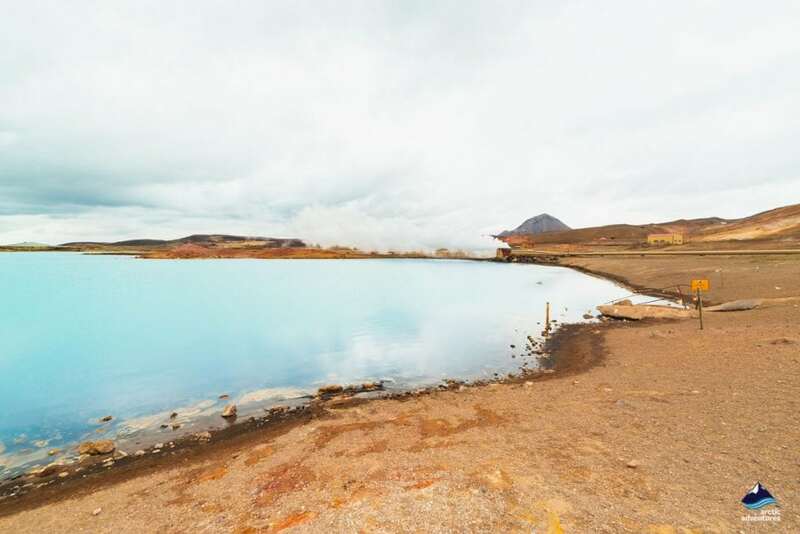 This makes the volcanic crater a popular bathing site but we only recommend it for those who have done their research on the water temperature and the location’s conditions before. Also the path down is often very slippery, especially in wet weather. 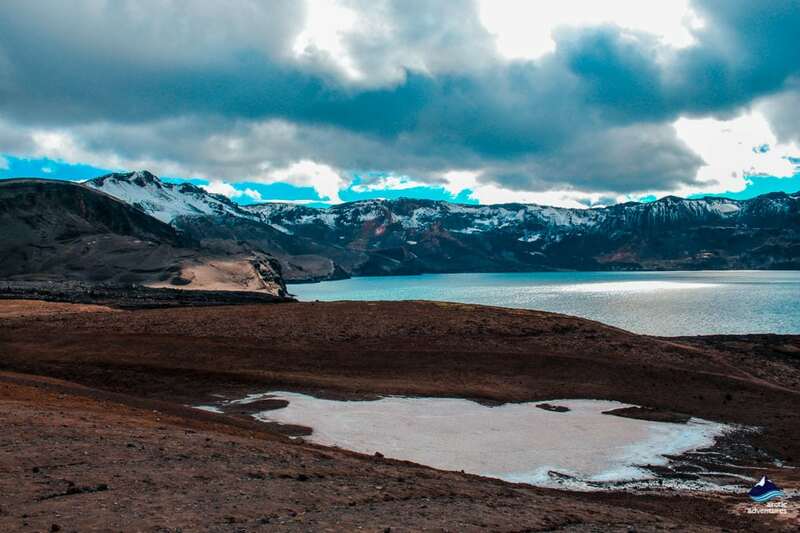 Askja’s location is extremely remote, in complete no-mans land in the central highlands right north of Vatnajökull glacier and only accessible for a few months of the year. Getting to Askja is, like stated before, ill-doable in winter time but when most of the snow has cleared you can take the road from road 1 to road 901 and then onto mountain road F905 (keep in mind that an F road is prohibited for most car rentals and you might be better off joining a tour). From F905 you go onward to F910 and then to Drekagil. 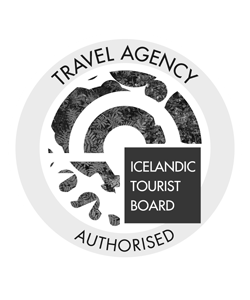 From Drekagil you can take the mountain road number F894 which is about 8 km to Askja’s car park at Vikraborgir. If you are looking for another option you can take the mountain road F88 off Road 1 via Herðabreiðarlindir to Drekagil. If you take this road there are fords on the rivers, both the Grafarlandsá and Lindá that need to be crossed. The fords can be difficult or even impassable for small vehicles and this is important to know before heading out. Askja located is extremely remote, in a completely no man’s land in the middle of the Icelandic highlands. In order to reach Askja in wintertime, one would have to have a fully equipt Super Jeep with huge tires, a lot of experience in highland driving and a good GPS. In conclusion, Askja is a place to visit in summer. But, if you are still keen on visiting Askja in winter we suggest looking at our private tour page and we can see if that can be arranged. 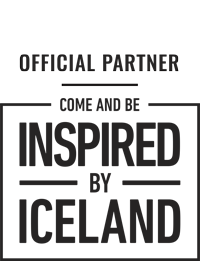 They have a way of making the impossible, possible! Askja was as good as unknown until the 29th of March 1875 when a gigantic eruption started. The ashfall was heavy, especially in the closest fjords in the East and was enough to poison land and kill livestock. The wind even blew ash all the way over to Norway and Sweden. This eruption started quite the emigration wave from Iceland and agriculture and life, in general, became harder. The last eruption to occur in Askja was in 1961. Two separate groups in the Apollo Geology Field research team came to Iceland, the first one in 1965 and the latter one in 1967. The plan was to train for landing on the moon and Iceland was thought to be the perfect ground to do so. Earlier the group had traveled to Hawaii, the Grand Canyon, Alaska and Arizona but now it was Iceland’s turn. 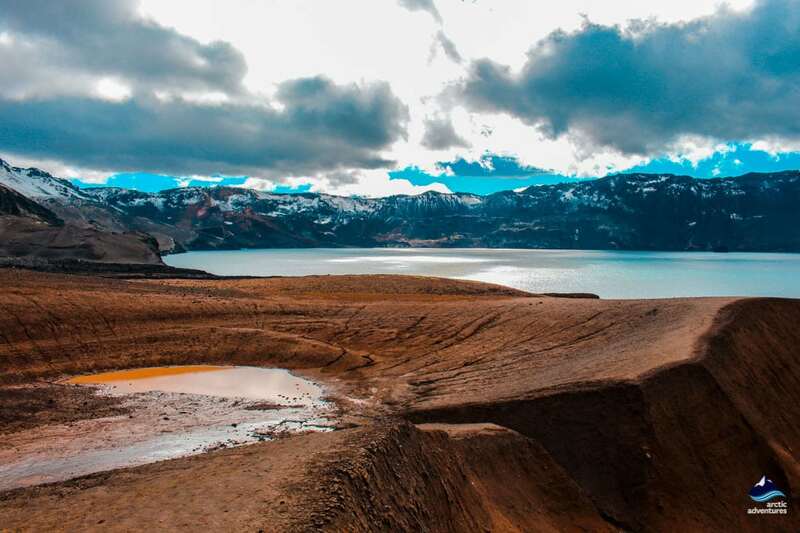 As Askja is located in the rain shadow area in the North East of Vatnajökull glacier it only receives about 450mm of rainfall annually and was therefore perfectly dry to practice, no humans around and it had the most moon-like terrain. The second group focused solely on the areas of Drekagil, Lake Mývatn and Askja. Öskjuvatn basically just means the lake of Askja. 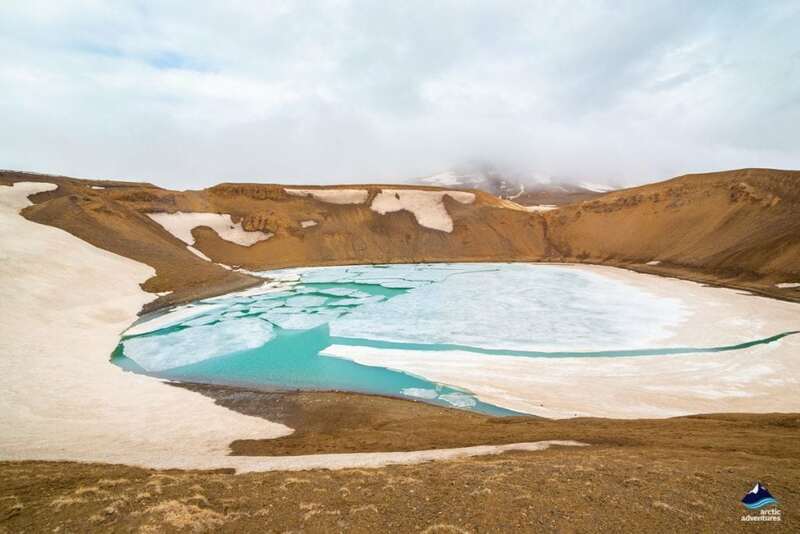 Its surface area is about 11 square km and the depth around 217 m2 or 712 ft which makes it the second largest lake in Iceland after Jökulsárlón glacier lagoon. 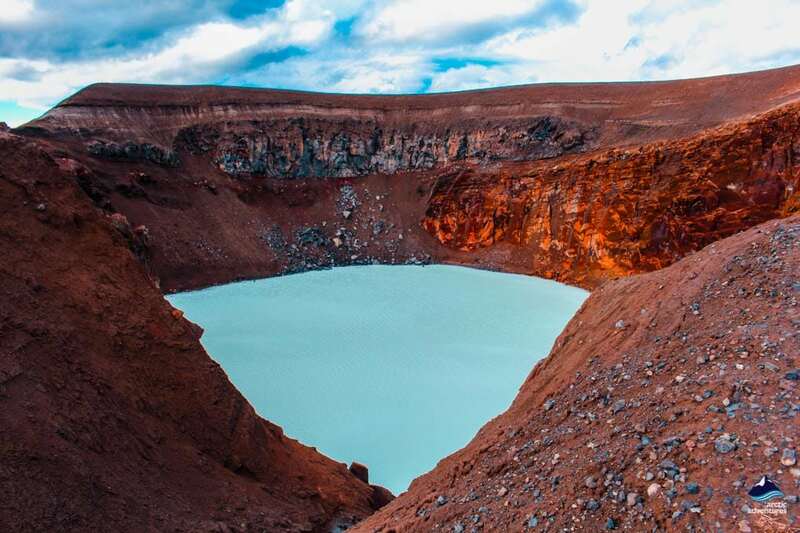 The lake is situated in the middle of the crater of the volcano that we call Askja and its water is extremely turquoise blue making it quite mesmerizing and very photogenic. No movies, TV shows or music videos have at the written time been shot at Askja. This might be due to the fact that it is considered unsafe or the fact that the area is quite difficult to get to but at this time Oblivion is the only one shot in the nearby area. 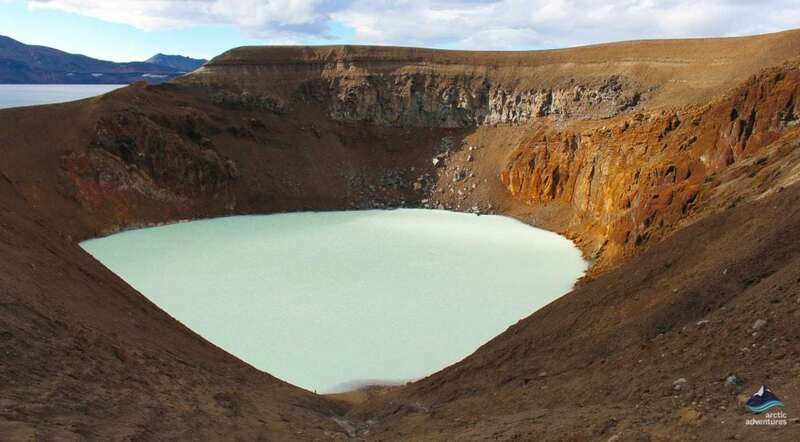 Oblivion (2013): The movie was filmed at Hrossaborg crater in North-East Iceland. Walk into the water! There is a great reason why you shouldn’t. Please read the story of the missing scientists. Litter! It’s very important that you don’t litter whilst exploring this remote paradise. 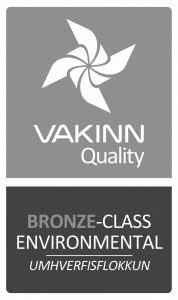 It is extremely clean and untouched and we would like to keep it that way. 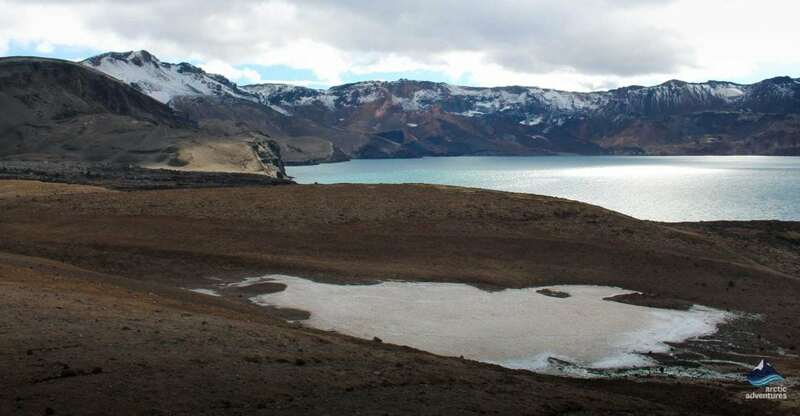 On the 10th of July in the year 1907 two German scientists, Walter von Knebel and Hans Spethmann and a painter, Max Rudloff, visited Askja to study and explore the caldera. After having stayed in the area for a few days Knebel and Rudolf decided to go out into lake Öskjuvatn on a small boat while Spethmann would continue to research the surrounding mountains. When the young Spethmann returned to their tents at night time the other men weren’t there. For five days Spethmann searched for his fellow travelers but without any luck or clues. Even after help had been received there was still no trace of the men. Von Knebel’s fiancée, Ina von Grumbkow led the search for them, but no indication of what happened to them was found and in the end, the case was closed. Before Ina left Askja she and her group built a monument which still stands today in the North East and in it is a guestbook for visitors to write it. At the West part of the lake stands another monument, which Austrian geologist and adventurer, Otto Woitsch, along with a great team wanted to put up and carried across the entire Vatnajökull glacier. During the expedition, he faced a lot of obstacles and ended up having to leave the monument plate in Krepputunga and barely survived the trip back. A year later in 1951, the Icelandic mountaineer Jón Sigurgeirsson from Helluvað brought the monument plate the last couple of miles to where it stands today. Some speculations were at that point that the scientists might have died in that area. It wasn’t until 2014, when an observation on the effects of a landslide, led to renewed speculation that the scientists might have been killed by a massive wave caused by a landslide which is estimated to be about 30 meters (98,4 ft) high. The nearest camping ground to Askja volcano is about 2,5 hours drive away so actually not very close. This camping ground it the one at Möðrudalur. 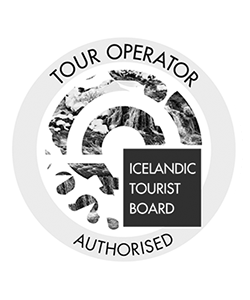 A superb tour from Akureyri to some of the most popular attractions in northern Iceland. 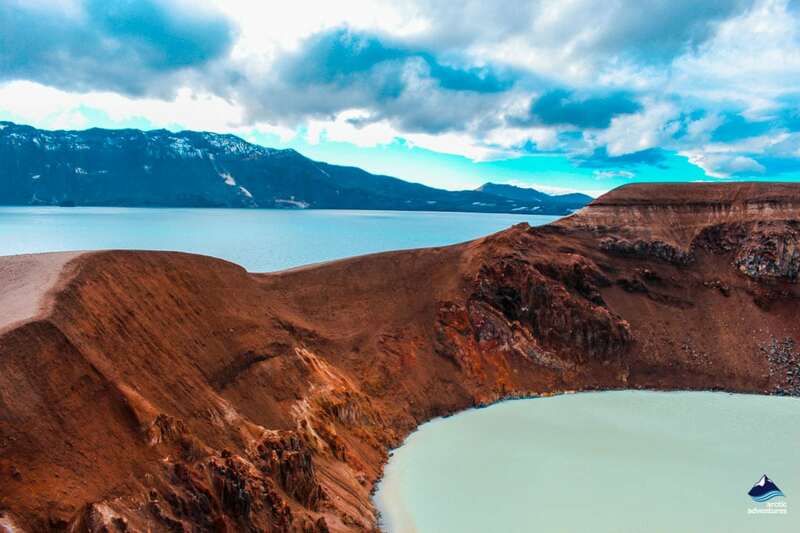 Waterfalls, volcanoes and the marvelous lake Mývatn are among the natural highlights you can expect on this tour. Askja is one of the most desolate places on the planet. A stratovolcano surrounded by absolutely nothing but a moon-like desert landscape of lava rocks.